“Health club members often struggle with the reliability of Bluetooth, or other wireless smartphone pairings, to track their cardio workouts. MYE introduces new WorkoutScan Cardio Exercise Tracking system that enables health club members to transfer cardio workout data to their smartphones with 100% accuracy, announced Tony Garcia, MYE Entertainment founder and president. The new WorkoutScan system, along with other MYE products and services, will be demonstrated at IHRSA booth #1749 March 22 and 23 in Orlando. Small MYE WorkoutScan transmitters are connected to cardio machine C-Safe ports. When club members finish a workout session and press STOP data is instantly transformed into a unique digital QR code sent wirelessly to the MYE WorkoutScan 1.58-inch x 1.97-inch mini display mounted on the console. 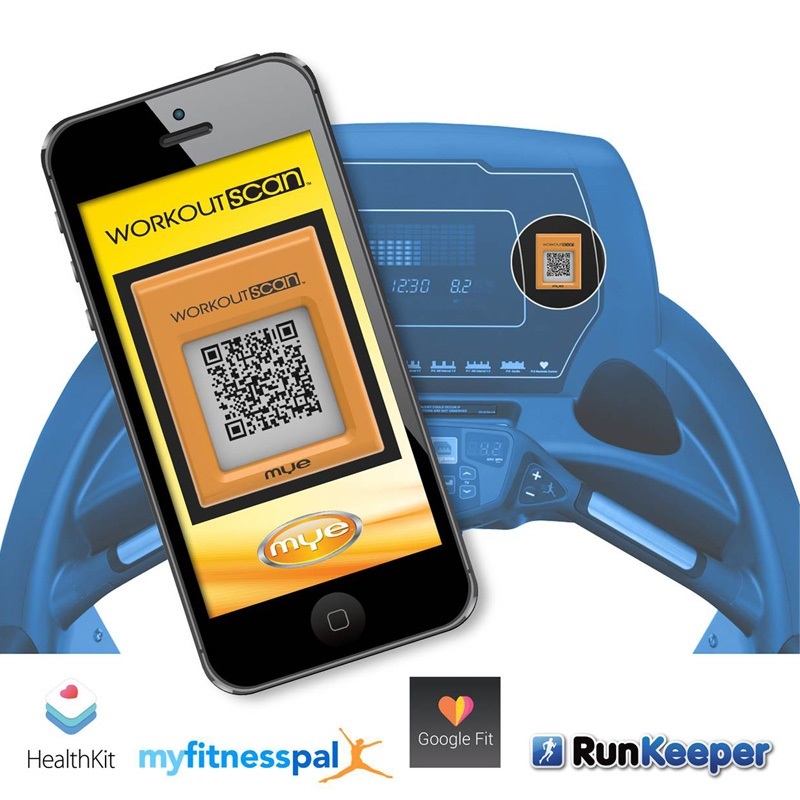 Members simply scan the QR code with their smartphone QR code scanner for instant workout transfer to their mobile tracking app with 100% accuracy and reliability. The MYE WorkoutScan system integrates workout data into any existing 3rd party mobile app, works with all smartphones and tablets with 100% accuracy, eliminates need to support Bluetooth or other wireless pairing methods, and is compatible with any cardio machine with an active C-Safe port. With the optional MYE CardioCare Machine Management online service the MYE WorkoutScan machine transmitter automatically captures data during every workout session and sends it wirelessly to the secure CardioCare datacenter. Your club staff, and/or service provider, has 24/7 online access to view and manage your entire equipment inventory. Instant text or email service alerts improve equipment efficiency while reducing down time and member complaints. MYE Entertainment Inc. is an electronics design and manufacturing company based in Southern California with state-of-the art production facilities in the USA and abroad. MYE develops and markets innovative advanced entertainment and service technology fitness products including WorkoutScan, CardioCare, AppAudio, MYE Digital Signage, Eclipse wireless audio transmitters and receivers, integrated TV audio receivers, LED TVs and mobile applications for leading brands including Cybex, Life Fitness, Matrix, Nautilus, Octane, SportsArt, Star Trac, StairMaster and Technogym. Visit MYEinc.com or call 800-779-6759 or 661-964-0217.